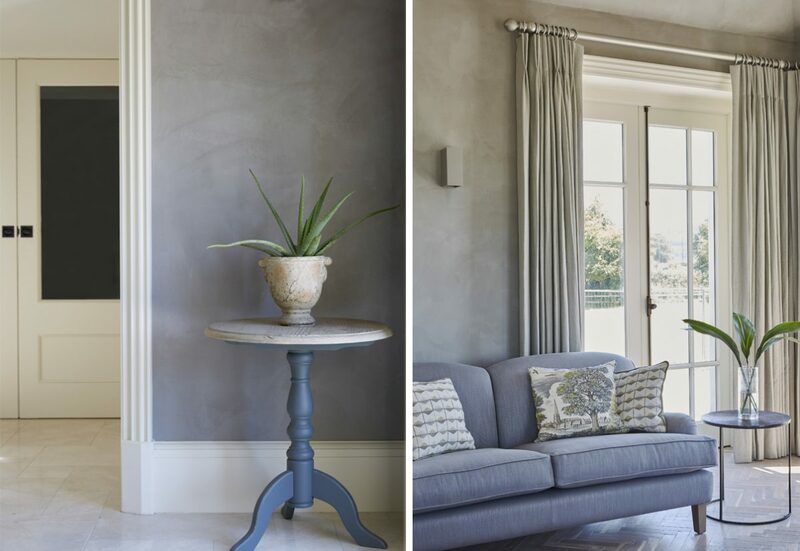 Clay plasters bring warmth, calmness and texture to Irish renovation. The owners of this recently renovated Irish home were searching for a more organic way of life and for the luxuries of calm, privacy and healthy, natural living. For luxury means something new now in our homes. In an age of fast paced life and technology and in the spirit of Hygge and Slow Living there is a desire for our homes to be defined by comfort and wellness. A welcoming sanctuary and an escape from the unpredictable where we can feel cocooned and safe. For design to respond to this need for respite and escapism, allowing occupants to feel relaxed and protected from the outside world, it might allude to hyper-sensorial, yet simple schemes based on raw, yet rich materials. All surfaces look richly textured, feeling soft and warm to the touch. The soft, neutral colour range is so sophisticated walls seem to blend seamlessly into ceilings and vice-versa, while tactility keeps them from looking too minimal. The Clayworks team spend countless hours at their Cornwall base conceptualising new finishes using natural minerals within the plasters. 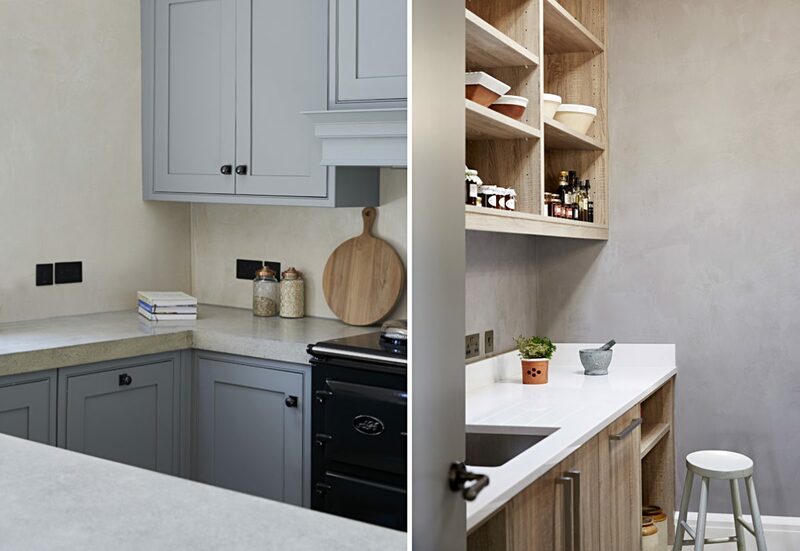 The aim with this house, as with every new project, is to create a finish that will help a space feel warm, welcoming and human, even before a single piece of furniture goes in. In this case the owners specified their own unique colours – variations on Clayworks standard colours Buff and Stone – which is easily achieved using an extensive range of mineral pigments and the company’s UK facilities. The owner of the house, who specified the use of Clayworks said: ‘I researched clay for two reasons: firstly the aesthetics. I’ve always loved the tactile nature of the finish. I don’t need pictures on the walls. A room is alive and ever changing when finished in clay, which you can’t achieve with paint which is uniform and static (and dead!). Clay also provides and instant aged look and feel. Secondly, the health benefits which were a big draw and fitted into the organic project. Once I’d spoken to a few clay companies, Clayworks was an easy choice due to the finishes and the company’s passion and enthusiasm’. Tranquil, refined, the elegant, simplicity in this home is achieved by bringing out the natural colours, forms and textures inherent in other organic materials, such as wood. Playing naturally with light and air quality in the damp Irish climate, clay can help with an illusion that is enhanced by a patina that absorbs light and does not glare. Plasters: Custom Colours based on Buff and Stone in a Smooth Top Coat, Non-Mica finish. Architects: David Pym & Associates, Ellenborough House, Dublin Road, County Kildare, Ireland. Construction / General Contractors: Michael Gorry Building Contractors, Clonmoyle, Rathangan, Co. Kildare, Ireland. For further pictures please see our gallery feature.